Seems like I'd wanted to tour Polyface Farms forever, and finally the other weekend we made it happen. 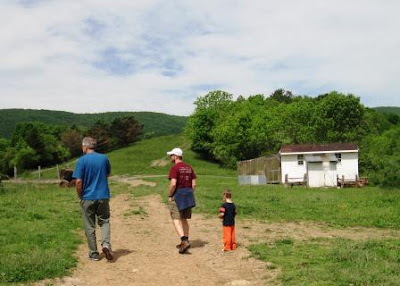 A multigenerational organic farm located about two hours from us, we'd watched the video, read some of the books, but needed to see it with our own eyes! I called up my parents, who were also eager to tour Polyface, and we met them there. All of the animals we saw looked healthy and happy. The cattle are moved every day so they stay on fresh green grass. 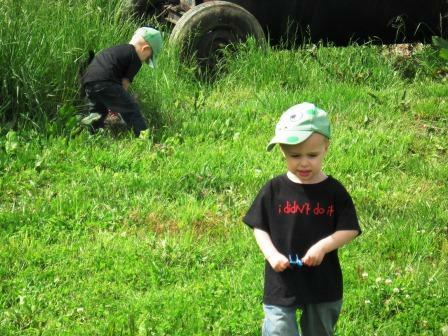 Cort and Reid had fun exploring. Reid is in the background, petting a barn cat. See Cort's shirt? Reid's shirt says, "Me Neither". This was the first time they'd worn them, and they were a huge hit! Beautiful greens. 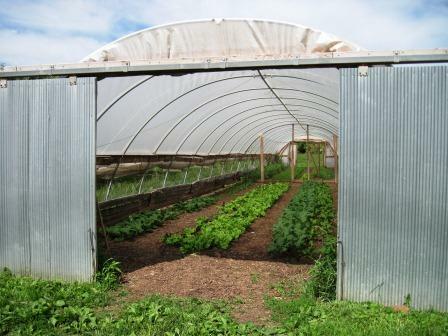 There were several hoop houses like these stuffed full of beautiful vegetables. See the wood furnace in the hoop house? They can use it to heat the house in the winter, when they have the chickens in there. 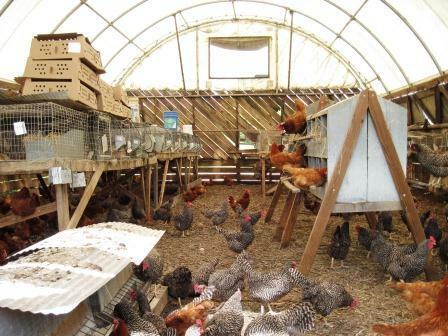 The chickens are moved frequently too, on this day they were in a permanent hoop house, where they were stirring up the dirt and matter that the rabbits had produced. Let me say that while it was full of chickens in there, there was absolutely no icky smell. The floor looked nice and clean, too. Rabbits! 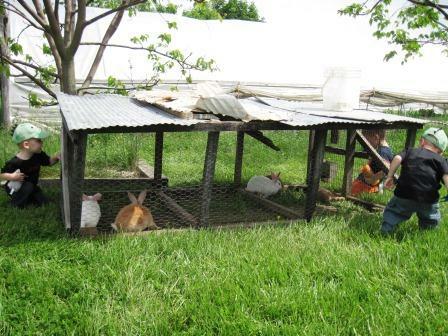 Their cage may not be fancy, but it's moved everyday, so they always have fresh grass. Walking up the road, to find some pigs. 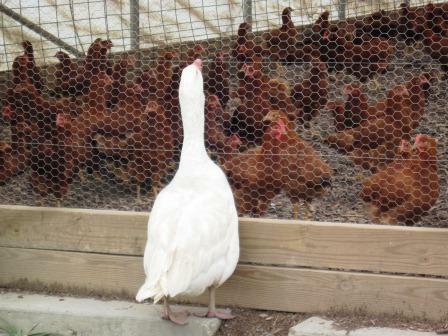 We found some chickens, carefully guarded by a VERY vocal goose. And we found some chicks too. 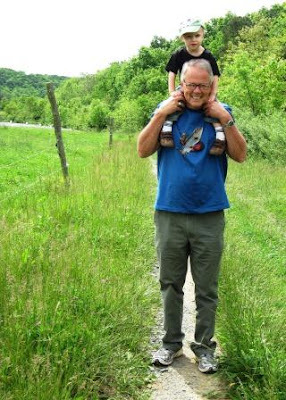 Lucky for Cort my Dad was there to be his buddy and carry him...all day long...so he wouldn't get his feet muddy. He was especially concerned about getting his feet muddy. So he says. I think he just wanted a free ride. This is the barn. The barn was full of pigs on this day. The barn where the pigs were was the only place we found to be a little smelly. 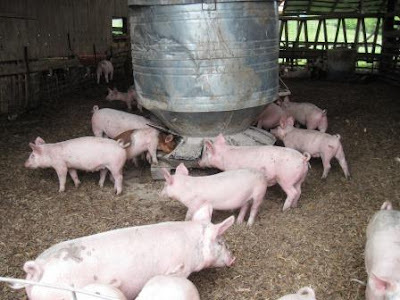 However, the place still looked clean and the pigs seemed quite healthy. Afterwards, we went in the shop, where you can buy their products. Unfortunately, we hadn't thought ahead to bring a cooler with us. 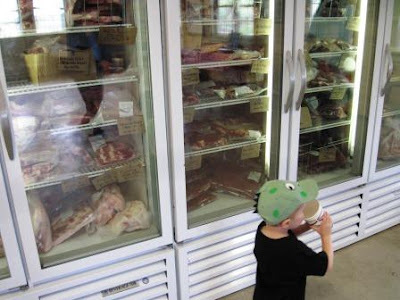 Their cuts of meat looked beautiful though - the organic bacon was especially tempting. Just outside the store. The boys had so much fun touring Polyface with their Cat Cat and Pop Pop! Your dad looks like he is having more fun then the boys!!! Ella's dad had a chance to work at Polyface Farms once. Some of our local restaurants serve food from there. We have the book The Omnivore's Dilemma" but have not read it yet. I didn't know they had tours! What a fabulous experience for your kids and entire family! I love farm visits. It looks like a very busy place and a great place for the kids! They obviously enjoyed all the animals. Somebody has a full time job keeping up with everything there. What a great place to visit with the family. And it looks like all the animals are taken care of well. Lucky.. Cort. I wish I had someone around to carry me so my feet don't get muddy. I love the twins shirts! This looks like a wonderful farm to explore. So cool! I would love to visit there, thanks for taking me along on your tour!! I love the twins' shirts! Another fun tour- my grands would love this place. Oh how fun! We want to go there one day! I really need to look into their tours; I don't think they are but so far from us either. So glad you got to see the operation first hand! 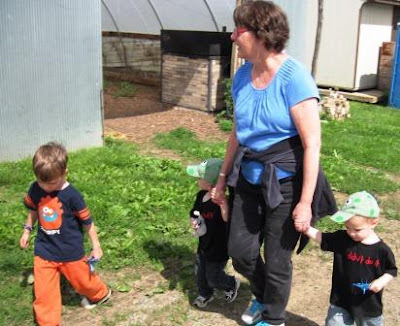 what a great farm and i love the boys shirts! when braden and dalton were about their age i got them these cute t's that said "yes we are twins and yes we are identical" to wear on outings lol...it cut down on the same question we would hear over and over and instead got some laughs! 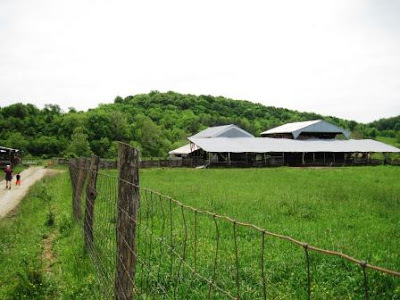 looks like a great farm! kids are so cute. What a super place for the kids to explore! I enjoyed you sharing the tour and cute pics of the farm. Thanks so much for hosting; this is my first time to join in. I have enjoyed visiting around this a.m. Have a great day. I've signed up to follow you. Looks like fun! !! Bet the boys loved it! !!! hi lisa, thanks for this lovely pictorial tour and for taking us along. 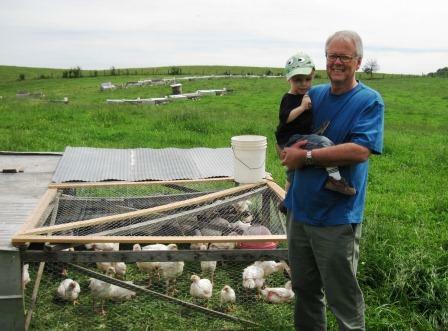 looks like a lot of fun and a great farm! your kids are soo cute! That looks like a fun tour. 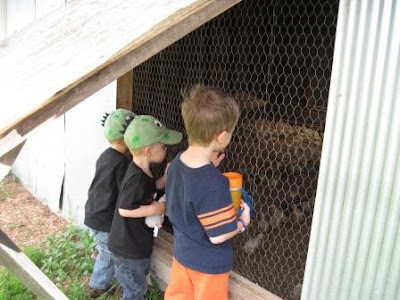 I grew up in a small city, and every time I had the chance to visit a farm, I loved it. The shirts are funny! Looks like a fun time for everyone! Love the t-shirts on the boys! Sooo cute! My cousin has twin boys that are just one year. Delicious pictures, I love the organic farms. There's not anything I enjoy more than visiting farms, and that one is great. So glad your parents met you; they look so happy with the boys. Have a wonderful day, Lisa. What a great place to visit! I love those tee shirts! 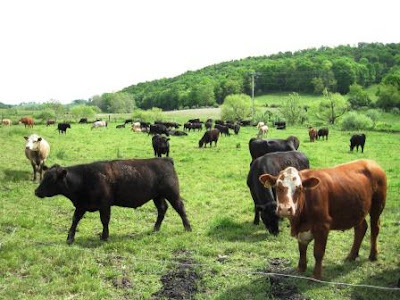 Looks like a beautiful farm where the animals are well treated. That's good to see. Your boys and their grandparents seemed to be having a ball! Photos of your boys on trips like this always show them so intent, so interested in what they're seeing. Well, I certainly enjoyed the tour through your lens...many thanks. What a great experience for your boys! Looked like fun! That sounds like a fun day. Very impressive farm! Like the boys shirts. Love the shirts! I can see why they were a hit. This is the way farming should be. I so appreciate folks that do it right. I have read Joel Salatin's books and enjoyed them. I do like his philosophy on farming. Great pictures and great place. The farm looked so beautiful. Seeing all those animals would be so much fun! Animals are so great, always a great way to give kids a good time. Those piggies are ahhhhdorable! the shirt is so fun! I have always wanted to visit Polyface!! I grew up in the Blue Ridge mountains (near Roanoke), now I live in Philly. One of these days, on one of our trips back to visit my parents, I am determined to take a tour. Love your photos! (I also run.) Glad I came across your blog. That looks like an awesome farm! It's so cool that they move the animals so they can have fresh grass every day. I enjoyed your visit to the farm. 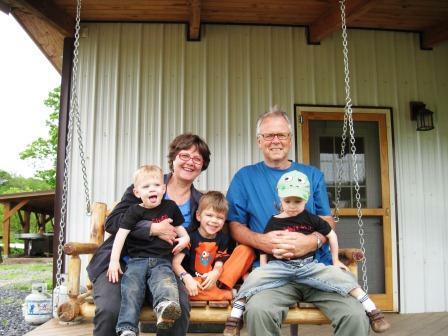 What I really loved was seeing your mom and dad - they look so sweet and the kids were so happy! How fun! I especially love that last picture. They look so adorable together. :) Looks like a fun time! 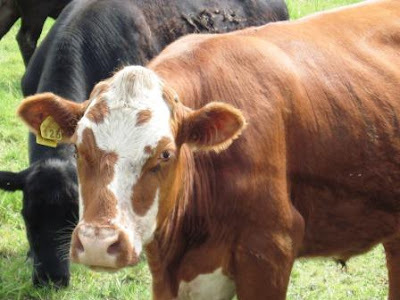 I have this thing for cattle. I just love their faces. The shirts crack me up! Looks like a neat place.